These vegan matzo balls aren’t like the Jewish grandmothers’ classic recipe for the big, fluffy variety, but are delicious, easy to make, and soy-free. 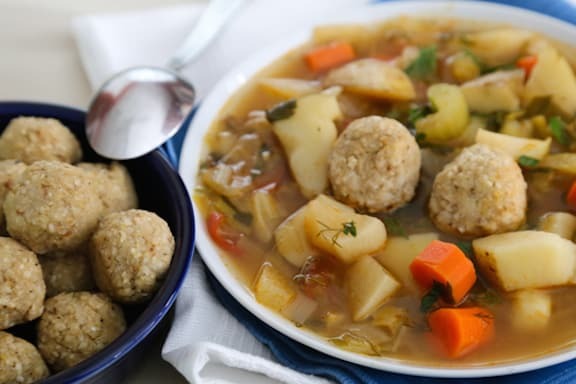 Many vegan matzo ball recipes on the web use tofu as a binder, which, for many Jews, is not an allowable Passover food; these use quinoa flakes. They’re baked at a low temperature rather than boiled. Without egg as a binder, vegan matzo balls of any kind are more likely than not to fall apart in water. I’ve also included a gluten-free variation using additional dry quinoa flakes instead of matzo meal (though with only quinoa, technically they’re not “matzo” at all, just matzo-like). More quinoa flakes are needed than matzo meal to hold these together, as they’re less dense. These go very quickly and everyone usually wants more, so if you’re increasing the amount of soup to accommodate a larger crowd, or serving more than 8 people, you would do well to double this recipe, which makes about 24 matzo balls. These are delicious in either the simple Vegan Matzo Ball Soup or the Moroccan-Style Matzo Ball Soup. Adapted from Vegan Holiday Kitchen. These vegan matzo balls aren't like the Jewish grandmothers' classic recipe for the big, fluffy variety, but are delicious, easy to make, and soy-free. In a large mixing bowl, cover the quinoa flakes with the water. Let stand for 2 or 3 minutes. Stir in the matzo meal (or additional quinoa flakes for GF), salt, pepper, optional onion powder, and oil. Mix until well blended. Cover the bowl and refrigerate for at least 15 minutes. Just before baking, preheat the oven to 275º F.
Form the matzo meal mixture into approximately 1-inch balls; don’t pack them too firmly. Arrange on a parchment-lined baking sheet. Bake for 20 to 25 minutes, carefully turning the matzo balls after 10 minutes, until golden and firm to the touch; don’t let them brown. Allow to cool for a few minutes before distributing among soup bowls, allowing 3 to 4 per serving. Tip: If making ahead of time, let the matzo balls cool completely, then cover until needed. Warm them briefly in a medium-hot oven or in the microwave, and distribute them among the soup bowls, allowing 3 or 4 matzo balls per serving. Note: Ancient Harvest Quinoa Flakes are certified Kosher, but not Kosher for Passover. If this is important to you for the Passover holiday, please make that distinction. Perhaps this will change in time, and we’ll keep readers updated! If your local natural foods retailer doesn’t carry them, they can order a box or two for you. Or look for them online. Find more at VegKitchen’s Passover: Ashkenazic-Style Seder page. Get more on VegKitchen’s Passover: Sephardic-Style Seder page. i have been trying to make vegan matzo balls for weeks now. i tried flax, corn starch, and potato starch but it did not occur to me to bake them. i used streits mix. would it work to bake them with potato starch or flax? i would love your opinion. i am going to try your recipe too! also, is your cookbook jewish only or all religious holidays? thanks! Lisa, in the past I also found, if I’m reading between the lines on your comment correctly, that without egg, there is nothing to cook in the matzo balls, so boiling them only makes them fall apart, or at best, very mushy. So baking them has been a perfect solution. Given the simple formula here, I would say you can go ahead and tinker with it, and let us know how it works out! But of course I would try to perfect your rendition before the Seder itself. The forthcoming Vegan Holiday Kitchen covers Thanksgiving, Christmas, Hanukkah, Rosh Hashanah, Passover, summer entertaining, and Easter, plus a few general menus and recipes for appetizers, brunches, and potlucks. It won’t be out until late October, though. Are quinoa flakes the same as traditional quinoa? I have a box of that in the house, but it’s tiny balls, not flakes. I have a box of the Manischewitz matzo ball mix in the house and would love to utilize it, I was just looking for the right replacement for the eggs. Deborah, what you have is the actual quinoa grain, not quinoa flakes, which are flat and light and flaky. The quinoa grain would not be sticky enough to be the binder. The brand of quinoa flakes that seems most widely available is Ancient Harvest. See if your natural foods store can order you a box post haste before the holiday, or see if you can find it online. Someone asked me what she could use in place of quinoa flakes, even if it wasn’t exactly for Passover. So that would be quick-cooking oats, which can be used in the same proportion as the quinoa flakes. Oats are not used for those who adhere to the traditional Passover rules of hametz, however. And the internet is filled with vegan matzo ball recipes that use silken tofu as the binder (which I don’t think works very well), and tofu is not allowed under Ashkenazic Passover rules. Depends on how strictly you observe the holiday. I’m going to use Millet flour instead of Quinoa Flakes and whole wheat flour instead of the mixes in the box as an experiment…TODAY the 16th of April 2011. David, using millet and whole wheat flour, they won’t be traditionally Passover-appropriate, but let us know how they turn out! I tested two batches of these tonight. Overall, they held together well. My only warning would be to check the amount of sodium in the matzoh ball mix. There’s a huge discrepancy among brands: Maneschewitz is through the roof–so much sodium they were inedible. Their low-sodium version was an improvement, but the ‘regular’ Streit’s mix includes even less sodium than the ‘low-sodium’ Maneschewitz. Make sure you test which brand suits your taste before serving to your seder guests. Nava, one question: Any ideas on what I might be able to add or do to make these matzoh balls just a little bit more dense? Helen, I’m glad these worked for you. To make them just a bit more dense, add a little plain matzo meal or potato starch. And thanks so much on the heads-up on the difference in sodium content! I am going to make these matzoh balls right now – almost. I don’t want to use the mix due to the high sodium and the msg. What quantity of regular matzoh meal would I use? They have MSG? I see that the Manischiewitz brand uses monocalcium phosphate, but that is a leavening agent. It does, however, have a ridiculous amount of sodium. I’m going to have to check out the Streit’s brand. If you are going to use regular matzo meal, use 1 cup altogether, as each packet of the mix equals 1/2 cup. Let me know how it works out. You’ll probably need to use a bit of salt, too, so they’re not totally bland. Maybe pepper as well. I have a gluten free recipe that uses the quinoa flakes instead of matzah meal and they are delicious. You basically make them the same way as traditional matzah balls so they use eggs. Any ideas how to convert that recipe so that it is vegan? Randi, try the recipe above, substituting the dry quinoa flakes for the matzo ball mix (1 cup) and doing the first step (covering the quinoa flakes originally called for, which substitutes for the egg, with water) as instructed. You’ll probably have to add some seasoning. Let us know how it works out! Will give it a try. By the way, I have had your Vegetarian 5 Ingredient cookbook for a number of years. I didn’t realize you had this nice website. Thanks! I made and served the vegan matzoh balls yesterday. They were very good. My box of mix was for matzoh balls and soup mix. The ingredient list did not say which ingredient was in which packet, so I assume the msg was in the soup packet – not the matzoh ball packet. Marilyn, I’m glad you enjoyed them. I’m glad you wrote earlier to point out about the sodium content. Yesterday I used the Maneschiewitz reduced-sodium matzo ball mix and it still struck me as too salty. I think I might try these again this week with just plain matzo meal, and a judicious hand with salt and pepper. I’ll post results if they come out well! Wow!!!! Your recipe looks so much easier! I’m going to try it! I had just used one recipe where she called for flax seeds and potato starch, and the mixture was so dry I had to add more liquids than what was called for. And instead of the flax seeds I crushed some quinoa to make it “flaky”. And it also called for chopped carrot stirred in it. It was okay, but the water was muddy and some fell apart. I like YOUR idea, and it seems much easier to follow! Also, is it okay to use extra light olive oil? I can’t imagine you cannot use that for Passover. Olive is a fruit. Minda, these really are super-easy. But per Helen’s comment above (about matzo ball mixes, even the reduced-sodium kind, containing a crazy amount of sodium), I just altered this slightly. I experimented with using just straight matzo meal and also making a gluten-free variation using both the soaked quinoa flakes and dry quinoa flakes. And they were great, I prefer them to the overly salted variety. Plus, being small, they absorb the flavors from whatever soup they’re in.If you try these, let us know how they come out! Do you have to bake them? What happens if you boil them? Dedra, I’m quite sure that if you boil them, they’d just fall apart. I’ve tried other vegan matzo balls variations that are around the web and that’s what happens usually, w/o egg to bind them together. The brief baking makes them hold nice and firm in the soup. I made these with your spring veggie soup recipe tonight! I couldn’t find quinoa flakes, so I just used all matzo meal. The whole thing turned out wonderfully! The only things I did differently was I put the matzo balls into the simmering soup for about 10 minutes at the end of cooking, and I used all veggie broth instead of water because I didn’t have time to let it rest for 2 hours. Veganmomma, I’m amazed that they held together with only matzo meal, but glad they did! And happy that you enjoyed these and the soup. Hope you had a good holiday. We used flax meal powder this year instead of eggs and it worked like a charm. Last year, we used Ener-G Egg Replacer and that also worked well. Matzah balls aside, feel free to visit and share my The Vegetarian Mitzvah at http://www.brook.com/jveg which has lots of info, quotes, links, and more on the connections between Judaism and vegetarianism. Just buy Isa Chandra’s “Vegan with a Vengeance” cookbook and use her vegan matzo ball recipe. Amazing! Not sure that ground flaxseed is kosher for passover, and I’m out-quinoaed (too much of a good thing). Wondering if I can use xanthan gum as a binder (for this and matzo brei) and still have it for Ashkenazic passover. Nava? Do you still check the comments on this website? Also (sorry for the multiple posts) I remember somewhere someone making matzo balls fluffy using seltzer. Would that work for these, or do they NEED to be boiled for a good selter fluffiness to translate? And, to MyRedSandal’s comment, the Vegan With A Vengeance recipe is good, but not Passover-friendly for those of us who observe the bulk of the dietary restrictions. The tofu is the problem, and is the reason these particular matzo balls (lacking a tofu binder) have issues with being boiled. ABYD, I don’t have ground flaxseed in these, so not sure what that part of your question refers to. While quinoa is allowed for Passover (if it’s Kosher for Passover), quinoa flakes are not technically Kosher for Passover. So it depends on how strictly you want to adhere to the rules. You’re right that tofu is not a Passover food for Ashkenazic Jews, though beans and grains not used by Ashkenazic Jews are used by Sephardic Jews during the holiday. In any case, tofu is not a good binder for matzo balls. I don’t think that seltzer would work with these; nor do I know whether xantham gum is Kosher for Passover, if you need to be strict about it. Sorry that I can’t be more helpful on your questions! better late than never! flax seeds are kosher for passover. buy them whole and get a new coffee grinder to grind them yourself for passover. Thanks, Lisa — and do let us know what you think! I’m pretty sure I’ve tried freezing these, and they were fine. I can’t see why they wouldn’t freeze well! Fingers crossed, as well … happy holiday! I found a gluten free matzo ball mix for sale this year (it seems like the main ingredient is potato starch). Could that be used here in substitution of the matzo meal? Zach, I can’t guarantee it, but maybe do a test run with half or quarter of the recipe. Can you let me know how it works out if you do? Nava–we used the GF matzo ball mix (which is essentially potato starch with onion powder, salt and pepper etc). It worked fantastically with the quinoa flakes. Everyone loved them at both seders! That’s great, Zach — maybe I’ll suggest that in the recipe for those who are GF and want a mix. If you see this response, can you let me know what the brand is? and boil in your soup. Both recipes are non-gebruchts, pareve and kosher for Passover. Thanks for this, Elaine. Though VegKitchen is a vegan site, not all our readers are vegan, so some who are GF but not vegan may appreciate this version. can someone tell me where to find kosher for pesach quinoa flakes online? I used quinoa grain instead, I soaked it in hot water then mixed it on high speed in thermomix and it turned into a paste. Then mixed all the ingredients – matzo meal, onion flakes, salt, pepper, formed balls then baked it. Perfect! So happy this worked out with the quinoa grain, Joachim, so I appreciate your input. A few readers have asked about this, so now we know! 2 things. 1-re: my previous post, pereg does not sell passover products directly. you have to find it in a retail store. 2- i tried matzo ball mix substituting golden flax seed meal for the eggs. that is, 1T meal + 3T water = 1 egg. the recipe on the box called for oil in addition to the eggs but i subbed water. i cooked the balls as per the recipe above. they needed closer to 30 min to cook thru. the result is something that resembles a traditional matza ball. it is round, it tastes like matza meal, it goes well in your soup but there is no fluffiness. i did try boiling them first but they disintegrated. i will be making this for my vegan mom when she visits at passover this year. for those who keep strictly kosher for passover, buy whole golden flax seed and grind it yourself in a passover dedicated coffee grinder. all the best! Thanks for all this valuable input, Bracha. Hope you and yours enjoy the holiday! Quinoa is a seed, not a grain. And so is Flax. That’s why they are Kosher for Passover. Will these work well if I make the week before and freeze or refrigerate? I have 32 people and can’t do that day. Ellen, I haven’t tried freezing them. I would say you’re safe to make them 2 – 3 days before your Seder and refrigerate, but not a whole week. You might try a half batch and see how well they defrost and stay together after say, 48 hours in the freezer. Enjoy the holiday! Where do you buy quinoa flakes? No Kosher store in Chi town? Do t hey have it at whole foods? Andrea, I’d be surprised if Whole Foods didn’t carry it. That would be a good place to start. Oh, dear! Perhaps there was a run on them due to Passover. The Spring Vegetable Soup with matzah balls has become a staple for our seder dinner. In order to cut more oil out of our diet, we replaced the 1/4 cup of oil from the matzah ball recipe with 2 tablespoons of vegetable broth. The matzah balls came out exactly the same. We in England can’t get kosher for Passover quinoa, but ground almonds work very well. Passover again, and this year I am not going to try to boil those eggless matzoh balls! What a great idea to bake them. Why not potato starch as a binder? But the best vegan binder is ground soaked flaxseed — it does not appear to be on the list of kitniot not to use on Pesach, does anyone know for sure? Everyone relax a bit about quinoa. It is officially a seed – not a grain. Because it expands when it is boiled, it tends to act more like a grain. Technically it is referred to as a pseudocereal but is more closely related to spinach and beets than to cereals or grains. So enjoy your quinoa for Pesach … and Chag Sameach! I agree, Deanne, so thanks for weighing in! It’s interesting to see how important tradition becomes in the celebration of holidays. It’s great to have ways to recreate old favorites, even after going plant-based. Enjoy the holiday! Can I use all Mazto meal instead of the quinoa flakes? Rachel, the quinoa flakes are what holds these together as the “glue” instead of eggs. With just matzo meal they’d fall apart. Depending on how strictly you adhere to the rules of Ashkenazic Passover, you could use oatmeal. Can I grind my own quinoa and use it instead of quinoa flakes? Or will the end result be different? Anyone know? So I have been vegan for over 25 years. I have created my own matzoh ball recipe. I make my own matzoh meal by processing in the food processor. to form matzoh ball mixture. Refrigerate overnight. Make balls, add to simmering water, after balls rise, remove w/slotted spoon. Sara, thank you for this interesting variation! Readers, if anyone tries this one, let us know what you think. There are 3 different issues: kosher, kosher l’pessach and kitniot. Some items can be kosher but NOT kosher l’pessach ( and it is always best to ask a competent rabbi about it, as the certification for Pessach takes into account the processing and packaging procedures), and what is considered kitniot , kitniot change according to customs and interpretation. Made the quinoa vegan matza balls for the first time this past Pesach and we were pleasantly surprised!! Didn’t have kfp quinoa flakes so just kept the quinoa whole, and I substituted 2 tbsp of applesauce for the oil. The consistency was great (not like a real matza ball, but tasty, firm, and pleasantly filling). I only added them to the soup right before serving. I didn’t store leftovers in the soup since they started falling apart and my husband preferred them whole. Delicious combo with the spring vegetable soup (which btw I didn’t use any water in that recipe; just all veg broth …..I could not find a kfp veg broth carton so just made my own.) Thank you VegKitchen for the vegan matza ball spring soup recipe!! Definitely planning on making next Passover………if not sooner! !